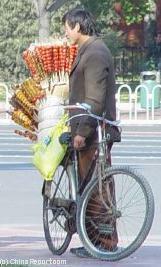 Man peddling Sugar-covered fresh fruits and berries, a traditional hutong candy sold from bicycles on the street. 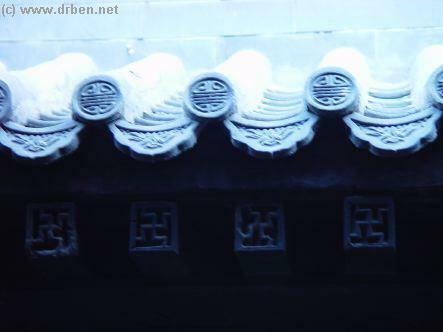 A traditional SiHeYuan Gate in the Hutong nearby QianMen and Old QianMen Station (2002). 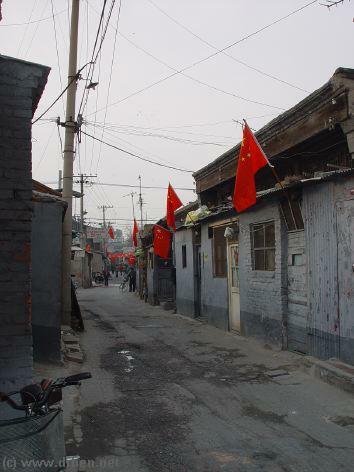 Proud Chinese flags lining the traditional Hutong of QianMen in Beijing during the 16Th Communist Party Congress. 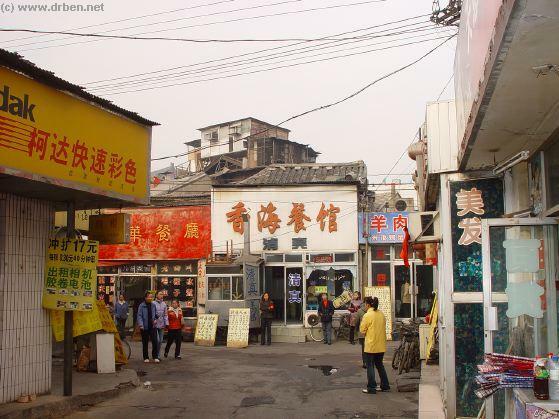 Some of the Hutong are very narrow alleys interconnecting larger ones and creating an enormous maze which is fun to browse through and discover. 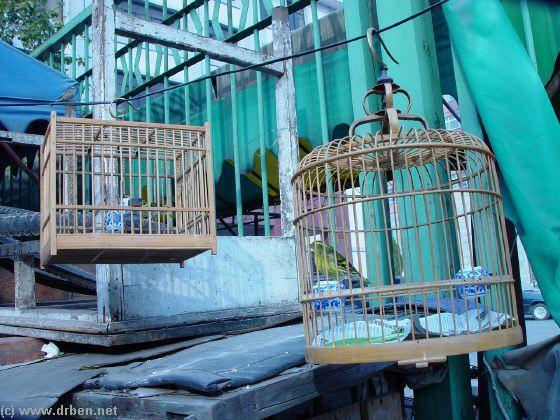 The peculiar bird-cage and hutong penthouse that stood immediatly south behind the alley leading away from Old QianMen Trainstation, past some dumpling places and into the hutong, but has now been cleared. What will be constructed there is as yet unclear. 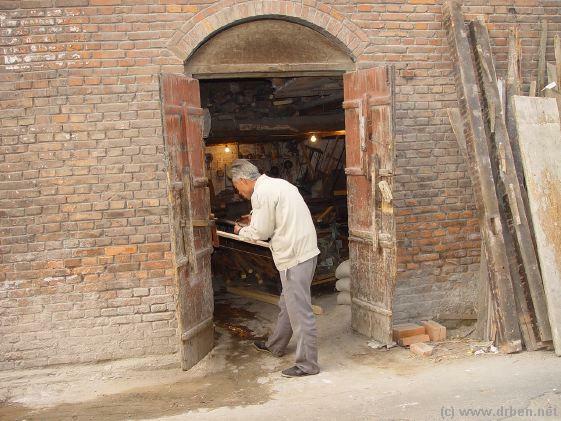 A historic scene from the QianMen Hutong in 2002. 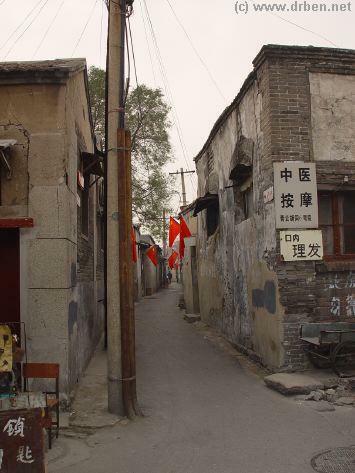 A now demolished part of the Hutong with the hutong-alley-road leading up to QianMen Station. In the background the service building adjacent Old QianMen Station. The child is displeased with all the attention ! "Old Beijing - Peoples, Houses, lifestyles"
"Place names are an important part of China's national cultural heritage, an old place name usually tells an unique story. 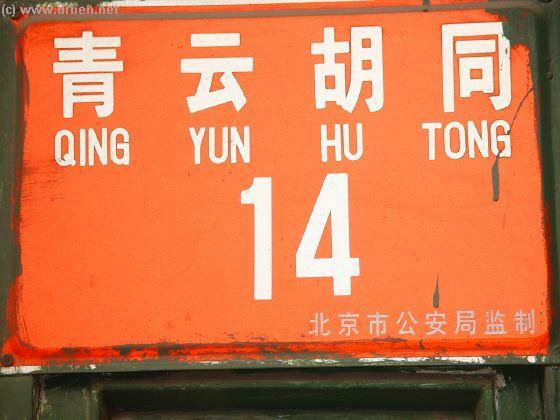 In China, every place name bears a special link with history. "With the disappearance of the old place names, there will come a day that we can't trace our culture and history." For most old Chinese, old place names serve as lively records of the ups and downs of the dynasties during China's 5,000-year-long history. According to official statistics, China has more than 700 counties, more than 1,000 towns and more than 300 cities with a standing of more than 1,000 years as well as more than 100,000 ancient villages that even their own residents can't tell how old they are. 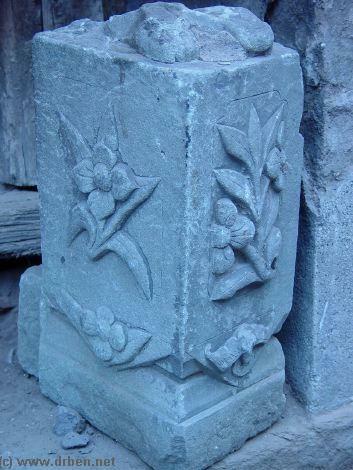 "Most of them bear a name that reflects the features of a special period of the Chinese civilization," said Liu. 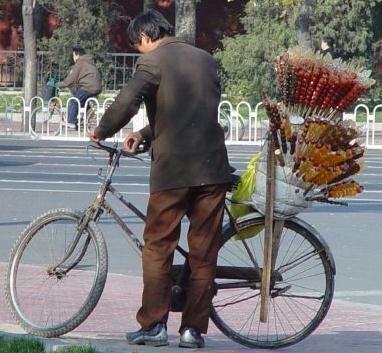 "They can be called 'living fossils' of the traditional Chinese culture." 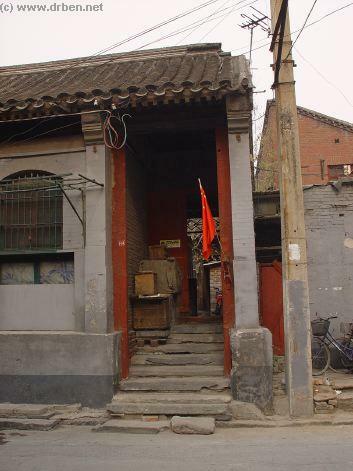 History of the Hutong - As described in our introduction to the Capital City, the earliest streets of Beijing were constructed in the Xuanwu District, then a cllection of tents, shacks and slums.Historical records show that the oldest "hutong" is Sanmiaojie in the Xuanwu District, which was known as the Tanzhou Street in the Liao Dynasty (916-1125). 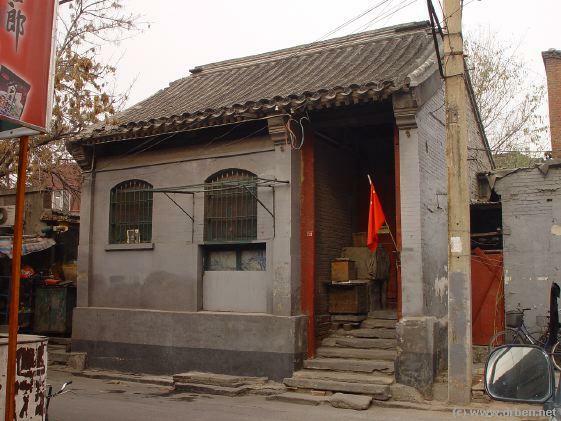 Beijing had a total of 458 hutongs in the early Ming Dynasty (1368-1644) and 978 hutongs sometime in the Qing Dynasty (1644-1911). 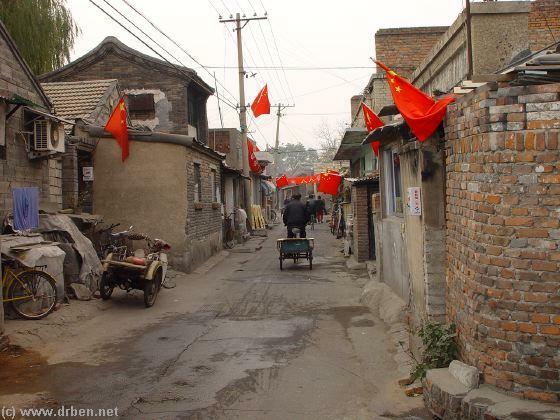 A total of 6,000 alleys had existed in Beijing when the New China was founded in 1949, and 1,330 of them were then named "hutongs". four-sided enclosed yards which often have historic place names. The "hutong" and "siheyuan", with their unique athmosphere and scenery are a major part of the city's tradition, architecture and culture. Of the traditional narrow lanes, which housed communities of close-knit families for many generations, many have disappeared, being flattened and the sites re-used for newly arrisen department stores, metro stations, widened boulevards and commercial and financial streets. 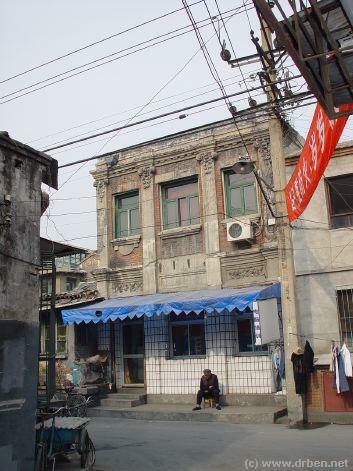 Especially in recent years (since 2002) Hutong are rapidly being replaced by modern buildings. 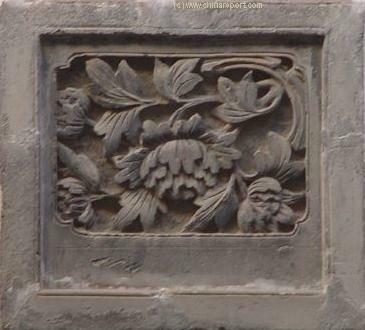 a total of 539 "siheyuan"
courtyards are under local government protection. overpasses, identical apartment blocks and skyscrapers. 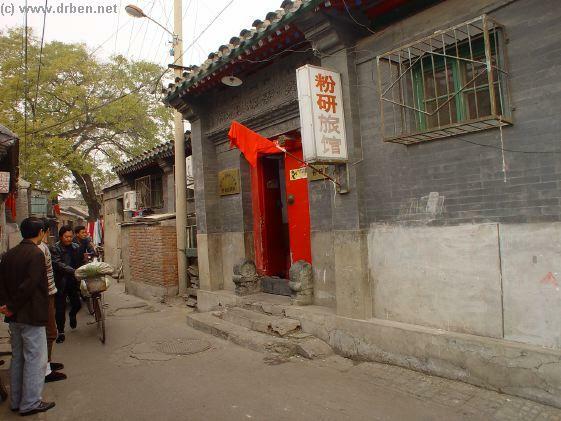 Before a major tourist attraction of the City of Beijing, an architectural maze only surpassed by the nearby Forbidden City, the Hutong that wound their way through the city for 100's of years are now nearing their end of the road. 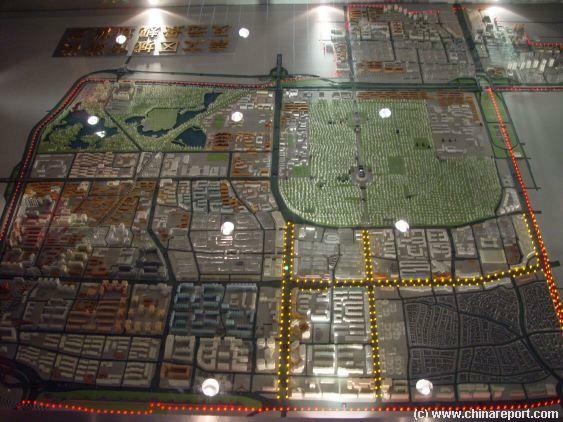 housing facilities, many of which Hutong, are an estimated 3 million square meters in Dongcheng, Xicheng, Chongwen and Xuanwu, the four districts in the downtown area. Of these, some 600,000 square meters will be demolished and rebuilt this in the first stage of the 5-year project. 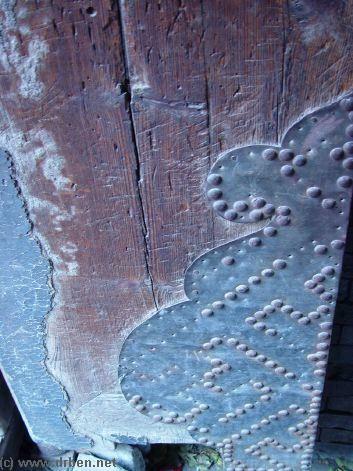 worthy and unworthy scenes, it's athmosphere and some of the architectural treasures. 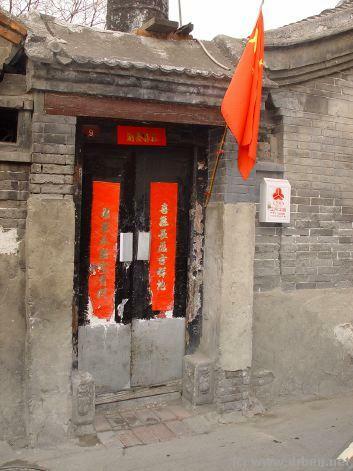 Local historic sites and cultural relics, including many Hutong will be protected during the renovation process to sustain Beijing's image as a historic city, according to the Beijing City Government. The former imperial city itselfm inside DongCheng and Xicheng Districts, will be seperatly protected and keep it's former appearance with low buildings, green rooftiles, and quadrangle housing..
300,000 residents had been evicted from their homes in the city to prepare for the 2008 Olympics. However, inn march 2004 Reuters reported on the case that: "Nearly 100,000 families have been evicted so far in Beijing and thousands more evictions are expected." 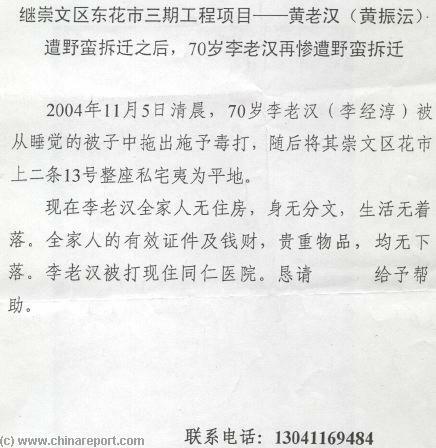 According to the City Government "Such reports do not reflect the real condition of household resettlement in the massive urban construction in Beijing". This claim can reasonably held for true as their have long been wider concerns of the viability of the Hutong and Old City Housing. 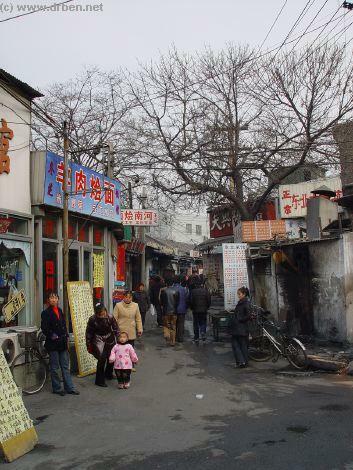 Hutong have been known as fire hazards through the ages. 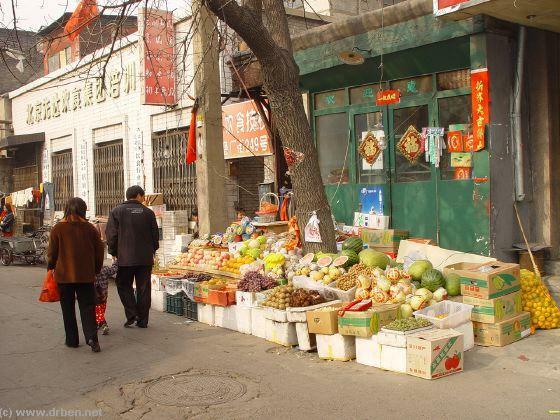 An influx of rural migrants to the city since the 1990's and the open toilets of the Hutong translated into a huge health risk during the 2002 SARS-virus crisis. 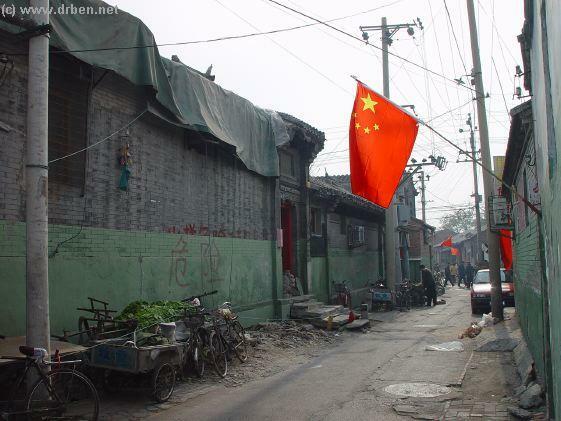 Since then the non-native citizens have topped over 4 million, many flocking to the cheap Hutong. 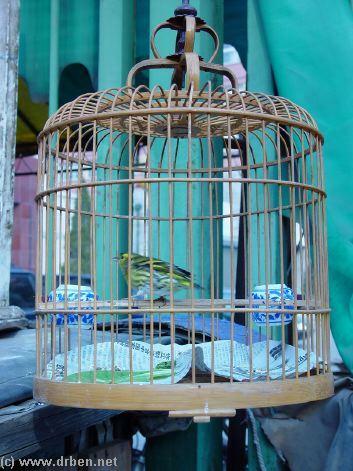 The recent boom, bloom and bust of Beijing Car Traffic, clogging the narrow old lanes and making the inner city unreachable, were another problem that did not go away. The combination of factors have recently forced the Governement into action. 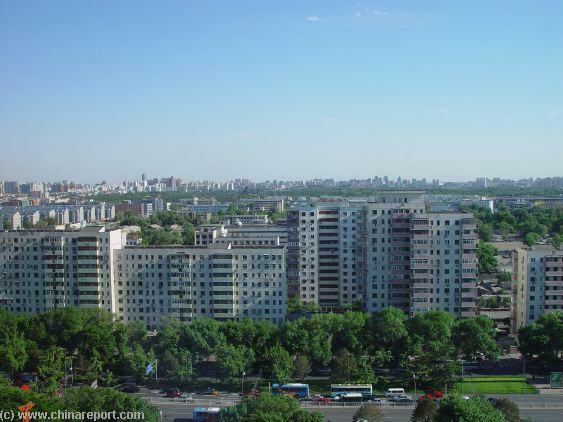 As a necessary process, not only in the modernisation of the City for the Olympics and beyond, but also in the elimination of health- and fire-risks, the reconstruction plan for the City of Beijing was announced in 2002 AD and will be completed by the year 2010. 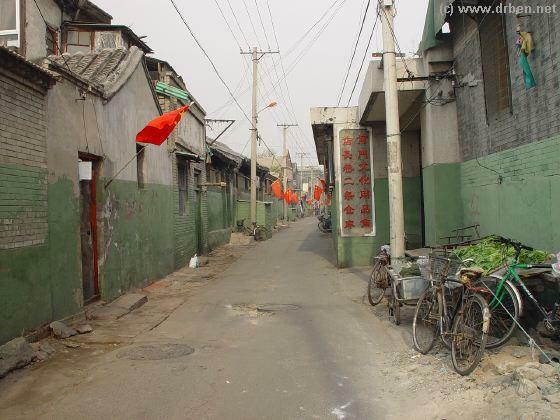 As such many hutong and redundant housing have had to be eliminated from the older city districts. 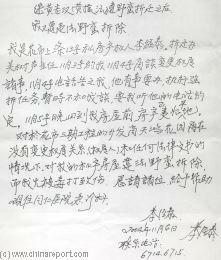 Miao Leru, director of the Beijing Municipal Administration of State Land, Resources and Housing, told a press conference. 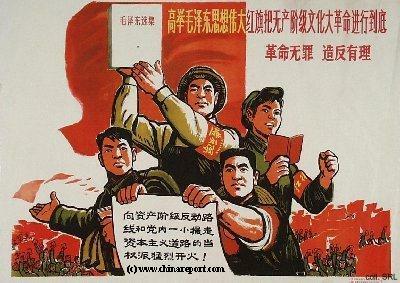 "The truth is over 400,000 households have been relocated since 1991 and their housing area has soared from 20 square metres to 60 square metres per family on average," Miao said. 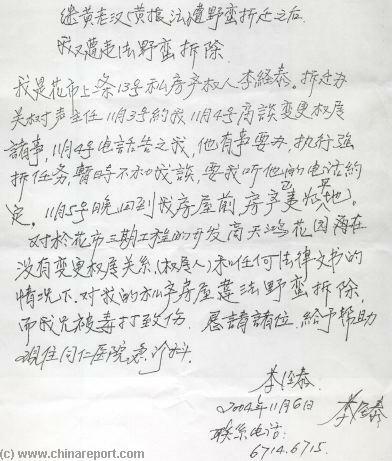 Miao admitted that in some cases demolition and removal were conducted illegally, but stated rigorously that such illegal acts make up only a small percentage of demolitions and household resettlement". There are sources reasons to believe this is true. During the first three quarters of last year, only four out of every 1,000 cases of demolitions were forced, said sources. The City Governement stresses that those who conducted illegal demolitions have been held criminally responsible and that compensation paid to relocated residents was higher than the average market value of similar real estate projects in the same area.One might observe that many residents of the reconstructed area's have since been able to move back to appartments that have been enlarged and brought up to todays'sanitary and other standards, essential in a large city. Chinese character 拆 (“chai”) meaning “destruction”. The Concrete Revolution - critical chinese made documentary film on the distruction of Hutong of Beijing and the creation of the Olympic City of 2008. - No longer available.